New Mexico Department of Game and Fish personnel who spend time in the field will at some point experience a myriad of calls and may end up adding yet another category to the list. Prior to becoming the Albuquerque district officer for Game and Fish, I worked approximately three years in Questa. I understood encounters with wildlife in an urban setting would be different in Albuquerque because it is not common to see a deer eating a rose bush or a bear raiding the local dumpster. What I did not prepare myself for was the number of “unusual” calls. 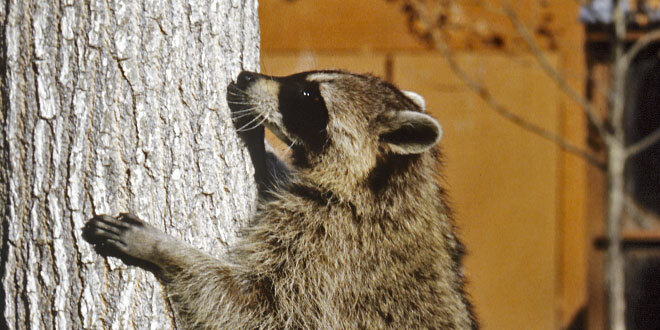 While driving through rush-hour traffic on a Friday morning, a call came in about a raccoon in a bathroom. I arrived at the house and acted as professional as possible, but honestly, a raccoon in a bathroom? Turns out the back door was left open all night so the dog could go in and out. About 3 a.m. the daughter went to use the bathroom and was greeted by the raccoon. They closed the bathroom door and contacted Game and Fish. There I was, catch pole in hand, Kevlar gloves on, ready for the unknown. I used my building-clearing training for a raccoon instead of bad guys, cracking the door open and “pieing” my corners, a technique used to see around corners. The raccoon wasn’t in view from the door, so I jumped into the bathroom and closed the door. Peeking around the edge, I expected to find a hissing raccoon curled under the toilet bowl. The only other possible place was a built-in cabinet, but the door was closed and it was approximately 4 feet off the ground. I cracked the cabinet door open to find the burglar-like mask of a raccoon staring at me. I stuck my catch pole in the cabinet and grabbed hold of the raccoon and the two of us made record time going from the cabinet to the front porch before getting it into a transport trap. Remember, given the opportunity, wildlife will enter a house, so make sure all entryways are secured before nodding off. I was spending time completing some online training when I received a message from dispatch. For both rats and squirrels, callers are generally advised to contact a pest control specialist, but the gentleman was distraught. I called the individual and it was a squirrel, but it wasn’t in the dryer where it could be shooed out the vent, but the washer. The man got little sleep due to the squirrel making loud “squirrel” noises. I was intrigued, so I decided to visit; it’s not every day you see a squirrel in a washer. Apparently it entered through an open door, scaled a pile of dirty clothes onto the countertop and imitated Superman as it jumped from the counter into the open, top-loading washing machine. I decided to take the squirrel out the back door and let it outside. I reached inside the drum and grabbed hold of the juvenile ground squirrel and took it straight from the utility room to the street outside. The squirrel ran as fast as it could in one direction while the man ran just as fast in the other. As the saying goes: Save the best for last. A message from dispatch was received regarding a cougar. Typically, bear or cougar calls are a priority, but this one was different. “RP stated there is a cougar or mountain lion that has gotten into the vents of the apartment building he is living,” was the message from dispatch. The building complex was in downtown Albuquerque, where there should be a mountain lion population of zero. However unlikely, the cougar gentleman deserved a return call. I left a voicemail with my call-back number, a decision I would later regret. It took a week to get a return call. I tried explaining if there was any validity to his story, it would have been breaking news on television and in the newspapers, which didn’t happen. As we ended our conversation, I wondered if this would be our last conversation. About two weeks later, I received a voicemail from a number I immediately recognized and mentally prepared myself for what I was about to hear. He said he was 100 percent sure he thought he saw a hyena at a car wash in downtown Albuquerque. To this date, I have not received any reports of a hyena running around the area. I wonder what my next conversation will be like with this gentleman who has my callback number.